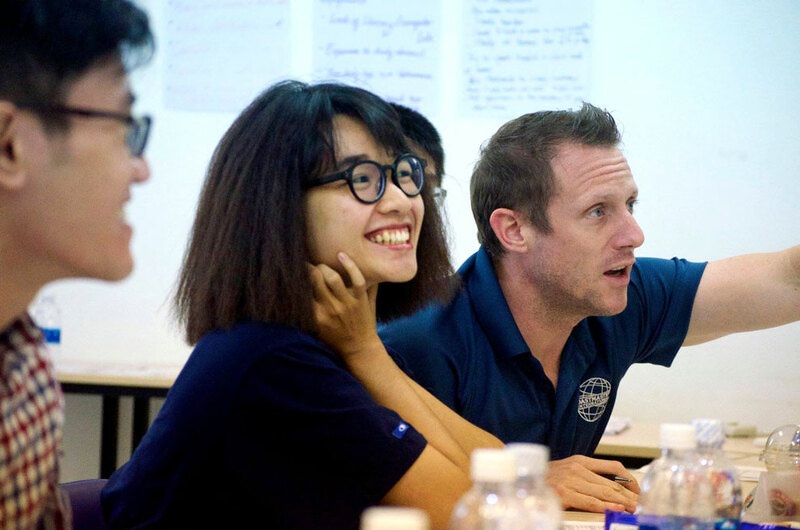 The International School of Business (ISB) here in Ho Chi Minh City hosts the monthly ISB Gavel Club. 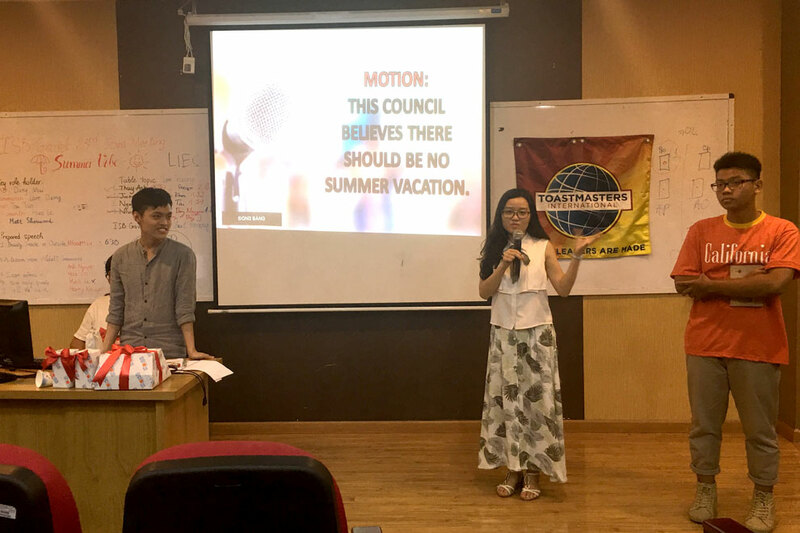 The format is very similar to a Toastmasters Club, but their meetings are a bit longer and contain a Debate section. But, seriously, the level of these speeches and overall leadership skills was baffling! Kudos to all of the kids for pushing their public speaking skills in front of a huge crowd (probably 50 or 60 in attendance). I’m not familiar with debate much, but it was fascinating to see the teams go at it! Overall, I was incredibly impressed by the level of speeches and leadership demonstrated by these students, some of which are only 15! I get inspired by youth leadership —- reminds me of when I was in high school. I strongly believe that an investment in communication training is a really wise investment! Whatever you do in life, whatever career you pursue, communication is vital. I believe if you can speak well, you will go far! The first round was fun! 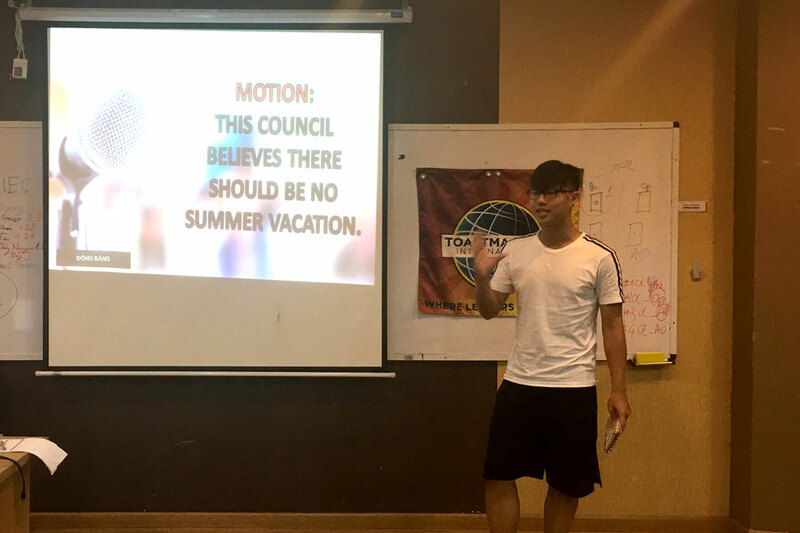 Each contestant was instructed to spend 1 minute talking about themselves, and 3 minutes delivering a mini speech based on any topic they choose. Some of these kids were as young as 13 years old! I learned a lot from the contestants, especially what topics seem important to young Vietnamese. For instance, body shaming and saving the environment were common topics. I also learned a LOT from my fellow panel of Judges, each of whom has extensive experience in speaking and each brought a different style to the Judges panel. In Round 2, I got to Coach my team of 8 contestants and WOW, I got lucky with such a great team! 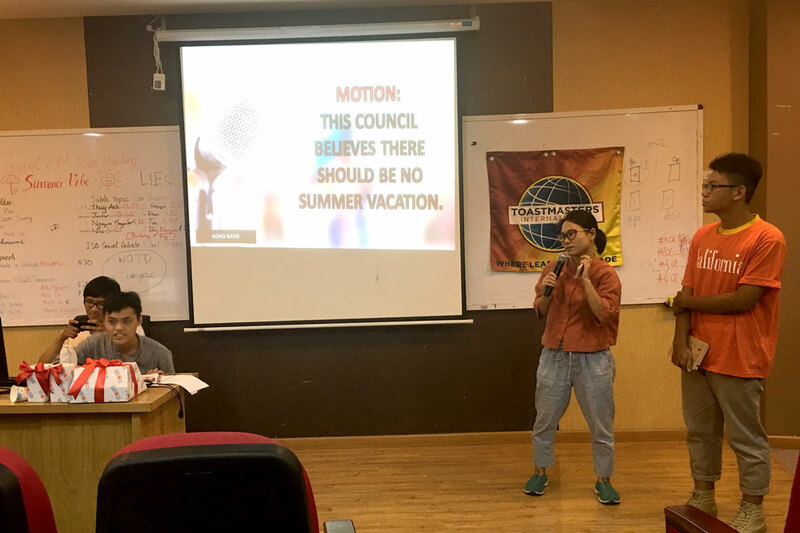 The contestants prepared a 5-7 minute speech to be video recorded, then posted to Facebook for online judging and judging by a separate anonymous group of Judges. If you want to watch some of the amazing speeches, you can see them on the ISB Gavel Club Facebook page here. It is incredible to see the level of quality for students that are 13-17 years old! 1 of my team members made it into the Top 6, automatically selected to compete in the FINALS! AND, 3 of my teammates made it into the Runner Up Round!!! The Runner Up contestants compete before the actual final, with 2 making it into the Final Round of 8! I was SO PROUD of my team! Overall the Final event was super fun, and I was so inspired by the contestants, who seemed to be having a ton of fun! The finals were fascinating for me, because they contained a lot of Debates, and I had to try and judge the debates. I have ZERO experience judging debates and it was difficult for me to determine whether one argument was more valid than another. The initial round of Debates were for the Runner Up group, to determine the 2 that would join the Final 6. Here they are, the TOP 8! Two of my teammates made it in: Brianna from the Runner Up round (Second from left) and Lam who was voted into the initial Top 6 (Second from right). It was not easy to judge, but we finally determined the FINAL 4! And guess what…2 of my teammates made it in! Here are the Final Four, with my teammates, Lam and Brianna in the middle. The Final Round debates were a bit crazy! First, it was difficult for me to judge, because two of my teammates were competing. I did not want to be biased towards them and therefore, I felt like maybe I was being too hard on them. Also, as I mentioned earlier, I have no experience judging a debate and even though the Chief Judge briefed us on how to score the ballot, I still was confused. Another thing…it seemed as though the debate topics could be much easier for one contestant over another. Personally, I would have a harder time arguing that traditional books are better than eBooks. But, I guess that’s the art of debate that I’m not familiar with! It was a very spirited final round of debates! Super proud of my teammates! Without further adieu…the WINNER OF THE 2018 ISB GAVEL ARENA: Ms Thuy Anh Nguyen! Watch the recap video of the Final here. All in all, I think anyone who competed in this contest is a WINNER. These students took a lot of time out of their summer vacations to work on their communication skills! I commend ALL of them for competing and I had such a fun experience working with them. And kudos for the organizing team and the many volunteers who made this event happen! It’s a LOT of work to be able to pull off such a big event that spans 2 months. Incredible job to everyone involved!! If you have a child, I highly recommend getting them involved in student debates, or youth leadership activities. The early investment will pay off in the long run. Or, if you are an adult and need help with public speaking, there are Toastmasters Clubs around the world. Find out more here.